It doesn’t matter if you’re into outdoors-y stuff, museums, or hiking. Stockholm is a city that has something for everyone regardless of interest or preference of luxury. Indeed, even if you’re on a tight budget, a visit to Stockholm would be quite an enjoyable experience. Hostels in Stockholm are pretty much well-kept and a lot of them feature modest but practical facilities. A handful are even located a couple of blocks away from the city’s most popular tourist spots. There are also some hostels located a little bit outside the city for those who don’t appreciate city noises. 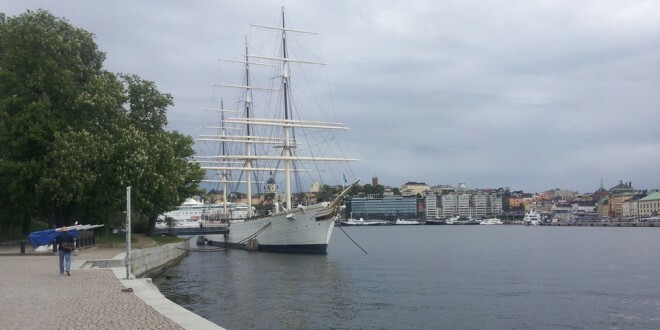 Located at Skeppsholmen, the hostel has a perfect location near the city center. The views from the boat great too – overlooking the Royal Castle and Old Town. Rated start at $30 for a dorm bed. They used to have bar/café on board earlier, which a lot of Stockholmers visited for a drink after work. It has closed, which is a pity, but the hostel still serves breakfast and lunch. Rooms are clean and they do have family rooms too. Pros: The location without doubt. And also, the fact that it is a different environment, being a boat. Cons: The hostel has rooms both on the actual boat, and in a building next to the boat. So be sure to ask when you book, if you really want to stay at the boat. With two hostels in the middle of the city, 2Kronor has one of the best locations among all of the hostels. With one hostel in Gamla Stan and another in Vasastan, guests would appreciate the fact that its near pretty much all tourist spots in the area. Train stations are also nearby, making it this best hostels in Stockholm. The rooms and the hostel itself is kept in pretty good shape, too so you won’t have unsavoury surprises waiting for you. Pros: The location. If your sense of direction is not so good, these hotels are perfect for you. Easy to find and near a subway station, you can explore Stockholm as much as you want without worrying how you’d find your way back home. The hostel in Gamla Stan also faces the water so you could actually have a view of the Baltic Sea. Cons: Some rooms are a bit expensive so if you’re running on a tight budget, this might not be the hostel for you. Backpackers will fall in love with this hotel. The rooms are small but clean which is perfect for those who would be out the whole day. The hostel also offers free pasta and you can cook as much as you want! It even offers a free evening sauna to its guests, making it one of the best hotels in Stockholm that give you more bang for your buck. Pros: If you’re on a budget, this is the perfect hostel! Free pasta, free Wifi, and beds could go for as low as 200 kronor! It’s also located pretty near the city center so its location is good, too. Cons: Privacy may be an issue especially during high season. Rooms get booked quickly too, so you might want to make reservations as soon as you decide to visit Stockholm. Quite a unique hostel in Stockholm, Langholmens Vandrarhem features both private rooms and dormitories. It was actually a prison that was open until the 1970s. Rebuilt and redecorated, it is now a modern and comfortable hostel for backpackers and travellers on a budget. It also offers breakfast to its guests as well as free internet access. Pros: Located in central Stockholm, you are minutes away from the city’s beaches and its trendy area, Södermalm. Cons: While the bunk beds go for as little as 200 kronor, it might be a bit uncomfortable for people of bigger built. This is probably one of the most charming hostels in Stockholm. Castanea Old Town Hotel is in the middle of Gamla Stan, so you can actually walk along cobblestone paths and pass by old shops and houses during your whole stay in the city. The cheapest beds go for 200 kronor, making it a really good option if you want a lot of value for your money. Pros: Staying in a hostel in Gamla Stan is quite an experience so this hostel’s location is pretty good. Since you’d be near a lot of interesting places like the Royal Palace, you’d end up saving on train tickets. Cons: Traffic and people walking around all the time may be a bother to those who are light sleepers or are sensitive to street noise. Everything about this place is new. Opened just in February 2012, it is slowly building a reputation as an excellent hotel in Stockholm. Rates go from 200 kronor which includes Internet access, linen, and a gym. It is located in Norrmalm, which is the center of Stockholm. This means easy access to public transport and places of interest in the area. Pros: Everything is new so you don’t have to worry about shabby rooms or shady sheets. The atmosphere here is quite relaxed, making it a perfect place to meet new friends while on holiday. Cons: This hostel is perfect for younger couples so if you’re a bit picky, staying here might put you off a bit since rooms are designed for function. This was my list of great hostels in Stockholm City. Have you visited any of these places or know any other good hostels worth mentioning? Share your comments below!